100 Heirloom Tomatoes for the American Garden, a detailed look at growing heirloom tomatoes, was written by an expert gardener who has grown more than 1,000 heirloom varieties in her own garden. This book is a fantastic resource for the true tomato aficionado, advanced gardener, gourmet chef – or anyone who wants to move to the next level of heirloom gardening. By the same token, it can be a little intimidating for the beginning gardener who doesn't realize that dozens of varieties in your garden are not a prerequisite to successfully growing heirlooms. Individual entries for 100 different heirloom tomatoes. 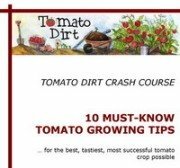 Each includes several paragraphs that describe the tomato’s history and characteristics, followed by a listing of its heirloom type, country of origin, maturity, color/shape, size/arrangement yield, plant-foliage, taste, and seed availability. The heirlooms listed in the book were chosen subjectively, based on the author’s taste buds. Many of the varieties reviewed are only available by one or two seed sources. It can be easy to think of this book as solely for gardening fanatics or tomato snobs, but it’s not. While the beginning gardener could be overwhelmed by its detailed content, nevertheless there’s plenty a newbie can learn about heirlooms from this book. The passionate grower or cooking enthusiast will consider it to be a treasure trove of information.